Harmon kardon dvd 50 worst machine ever harmon kardon used to b top line i paid $999 for this unit worked for maybe 2 years took it to a repair shop and they cany get parts.so now sittin for around for 7 years i figured id try and c if theres anyrhing i can dobefore i throw it out....i have harmon kardon avr 320 and avr 5 and will never buy hk again absolute garbage .thanks for taking our moneyg. I really liked the picture quality and sound from the unit until it just quit. Repairs to the pickup laser are estimated at $180. I never even knew there was upgrade software so never tried that. I have been told by the repair office in California the software was not the issue anyway. I had it over three years so only paid $166 per year of useage. HK tells me it is out of warranty so what I do is up to me. I just won't be buying a HK product again. My AVR 500 is also giving me problems consistent with other's complaints. Purity of sound and picture. Ease of operation. Plays a wide variety of formats. HDCD circuitry built in to decode that format. Very slow to load and read start-up information from disk. Carousel holds 5 CD's/DVD's, but does not play sequentially--you have to program with the remote to do that, otherwise it plays one disk and stops. Does not support DVD-Audio format or SACD audio format. DTS signal is not detected and sent to the amp, you have to select it from the startup menu of the DVD. I purchased this from the Harman web site where they sell re-manufactured and discontinued models at discount prices. I have used the player for about 2 years now with no problems. The quality of the picture is excellent, and the sound, especially with optical cable, is outstanding. Ocassionally it will have difficulty reading a disk and will display a "disk error". However, if you remove the disk and reinsert it, it will read on the second try. While this does happen, it is very seldom. Just as the warranty expired, the player stopped recognizing DVD discs. Then it stopped recognizing audio CDs. Local (trusted) repair shop called it a total loss, as it would cost more than its value to replace the ribbon cable and main board. Originally selected for the combination of features (prog. scan, quality DACs, MP3, HDCD). I'd still like to have those features, but I'm not sure I can afford a Denon DVM-4800. My gut tells me it wouldn't be wise to buy a remanufactured HK DVD-50 on eBay. Stand out stylish design. excellent picture and sound quality. convenient of 5 disc carousel. less disc selection control on remote. Need more innovative "bell and whistle" functions to justify higher cost. Excellent player. Little problems encountered and all can be solved quickly. I had over 300 DVD movie collections and I have play over 100 of them in three month. Only three incidents since I got it as refurbished unit from HK. Playback skip only in two disc that had finger prints. I wiped clean them with pure alcohol and it never happened again. The third case was a freeze up during change audio set up to DTS during playback. I punched the wrong button on remote and then made several quick attempts to correct it. I think the unit freeze up because contradictory commands present. It never happened again after the situation clear it self up. I think all the previous reviews regarding these type of problems can be traced to either dirty disc or lens, or user. If the user became irritated, then he or she will complicate the problem by punch in too many commands at once. I had a Pioneer LD player that I have to enter command in a particular sequence otherwise it will not work right. I bought this unit before I found out this reviewing site. I was worried after reading so many negative reviews and considering that I should return it before warranty expired. But at other AV discussion forum site, more complains about playback skip on almost every other brands across board. Many from brand new unit playing the very first new disc. I decide to give this HK DVD 50 a try and never happier since. It has an Impressive picture and sound quality compare to my older first generation Panasonic player (A100). The color and sharpness are astounding when playing movie like Saving Private Ryan and Stargate etc. There are many sound effects that I never heard before, but it may be due to new Denon receiver I got the same time. I serious suggest that people encounter playback skip situation should try to clean their disc with pure alcohol first (not the diluted or denatured type that might leave more residue). Getting angry and frustrated will only make thing worse. I have no problem with 5 disc carousel except that if there should be more disc selection control other than "disc skip" and it only go one way. Also, HK should not become compliance and sit on brand name recognition and fan loyalty. HK should try to include more innovative function to its product rather than less. 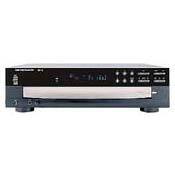 HK units cost more when compare with similar level of product from maker like Denon or Yamaha. People paid more will certainly expect more and tend less tolerance to problems. I will buy another HK unit but only after compare features and price with others. My experience with the DVD50 has been a positive one. I am quite pleased with the audio/video quality and the convenience of the 5 disk carousel. I purchased this as a remanufactured unit direct from H/K and was pleasantly surprised at the quality (functions and appears as new in every way). This machine is superior to both the DVD player and CD changer it replaced and only takes up ~ 1/2 the space. I would highly recommend the DVD50, especially at or near this price. I absolutely hate this DVD player. At first, the appearance, the features, and the reputation of HK brought me to pick this unit up. It has been nothing but regret ever since. About 50% of DVDs I purchase BRAND NEW will begin to skip half way through the movie, while some will skip for the first 15 minutes until the unit get going. Is there some warm-up ritual I should perform that someone else has figured out? I mean, I'll dance around a fire prior to starting a movie, if it means that I can actually sit down and enjoy an entire show. I definitely recommend AGAINST this unit. I own two Sony players, and they have been rock solid. Hell, I actually watch DVDs on my Playstation now, since it's hooked up to the same system as the Harman Kardon DVD-50. At least I know I won't lose my temper watching a movie! Form factor, price for prog. scan, great image. Lit remote. NEUROTIC Firmware. Who wrote this software? They need to take a DVD 101 course. A couple of Sony models.